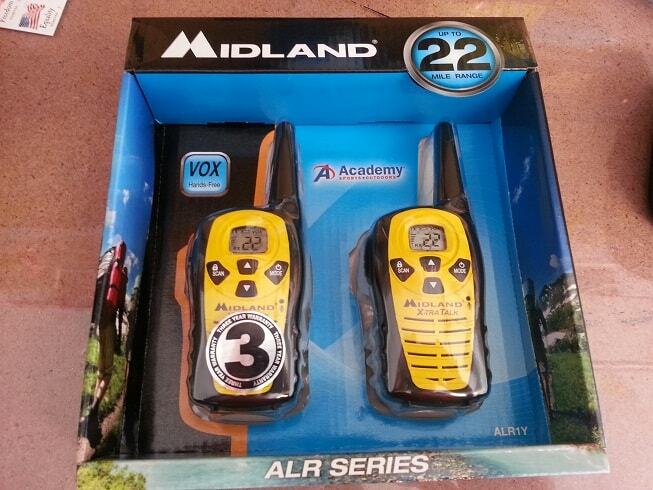 A few weeks ago Academy Sports had a pair of FRS/GMRS radios on sale for less than $20.00. I decided to go ahead and pick up a set to add to the three Midland radio’s I already have. This pair is marked with a 22 mile range which if you do not have any experience with these types of radios is just a crock. None of these radios obtain that kind of range. 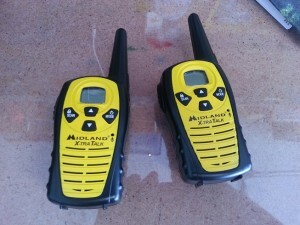 Much like I have done with my other radios I tested these Midland’s out at my brothers place in Georgia. He lives well in the country surrounded by tall tree’s and rolling fields. I left one of the new Midland radios with my wife indoors in the house, while I took the other and jumped on my mountain bike and rode up the road. At 1.4 miles I was still able to reach my wife back at the house with good clarity. Not bad. These Midland radios are very small, lightweight, and compact. Great for throwing in a Get Home Bag or Bug Out bag. They run on 3 AAA batteries and also include a hands free VOX option which worked fairly well. I prefer the push-to-talk operation. You can see listed below some specific details about the radios so I am not going to bore you with specifics. I found these useful and worked great. For $20.00 (or $24.95 regular price) I found them to be a great deal. They will not reach another state, or another county – but for local communications around a neighborhood or on your property – great for the application. Enjoy portability and reliability with the Midland LXT-118 22-Mile GMRS 2-Way Radios 2-Pack, which offer 22 total channels, including 7 FRS channels, 8 GMRS channels and 7 shared FRS/GMRS channels, and feature a maximum range of 22 miles to help you keep in constant contact with the rest of your party. The call alert feature notifies you of incoming calls, while automatic squelching acts to remove static and interference. On a final note…..I have owned many of these types of radios and have found ZERO difference in range between any of them. Whether the radio is advertised as having a 5 mile range or a 36 mile range – they have all worked the same for me. If they go on sale again I will pick up one more pair. What did you find to be max or near max range? I was riding my mountain bike on roads in a triangle. The furthest I got was about 1.4 miles and they were still working fine.